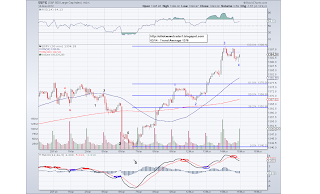 The market spent most of the day in 1407-1414 range I talked about couple of days ago and there is a pretty good change that the market will end up forming a right shoulder for the H&S pattern. The key would be a bearish Monday or Tuesday while respecting the 1414 level and once the pattern is confirmed, the downside target will be 1359. The trend average is still at 1405 but slightly trending down, so Monday/Tues should be fun as we should get a 15-30 move either way. I bought some SDS today but closed them at break even, so not going to bother with logging it. I am already invested for a move to the downside so that's already enough for me. And on a more serious note, I am playing the Mega Millions today. If you have numbers to give me, I promise to give you $1 million if I win :) I would need 5 numbers from 1 to 56 and 1 number from 1 to 46. I need the numbers by 6pm Pacific or 3pm ET. 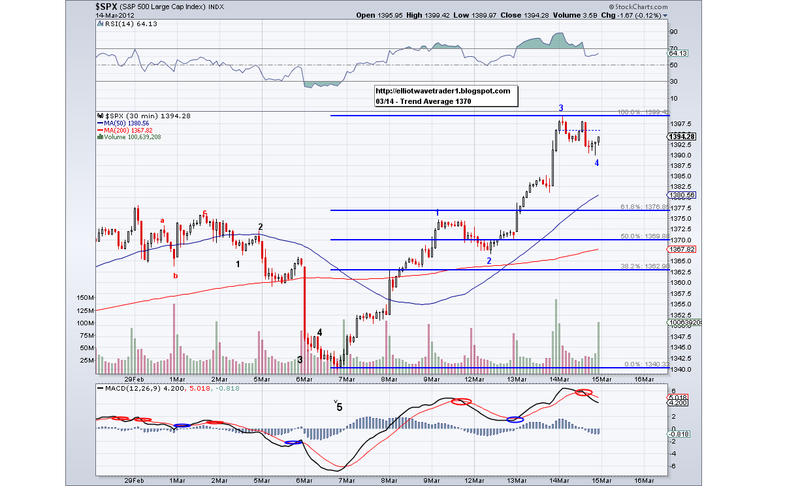 If what we are seeing in the market now is the right shoulder, we have a H&S formation targeting 1359. 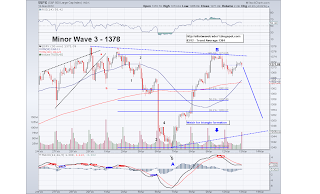 The market had a W4 in it and today we saw the end of the W5 at 1391, which got somewhat close to the 1387 level I mentioned yesterday and I am labeling this the A or W1 wave. We already have a bounce to the Fib retracement area which technically is enough for the B or the W2 but if we go by textbook wave theory, we should see a zig zag to the B or W2, so might see more upside that will meet resistance at 1407 and 1414. If these levels hold the market, then look out below as it will form a Head and Shoulders pattern and put in a nice looking B or W2 there. 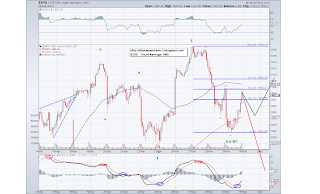 If the market can break through then we should see a higher high. 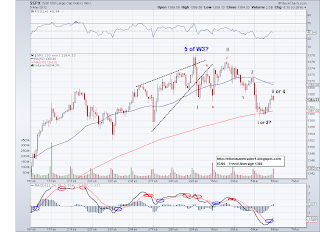 But as of now, we have a close under the Trend Average after an bearish impulsive wave. So optimists better come buying tomorrow or else the rally has a good chance for a substantial correction.. and remember this is all happening during an end of the quarter window dressing period. 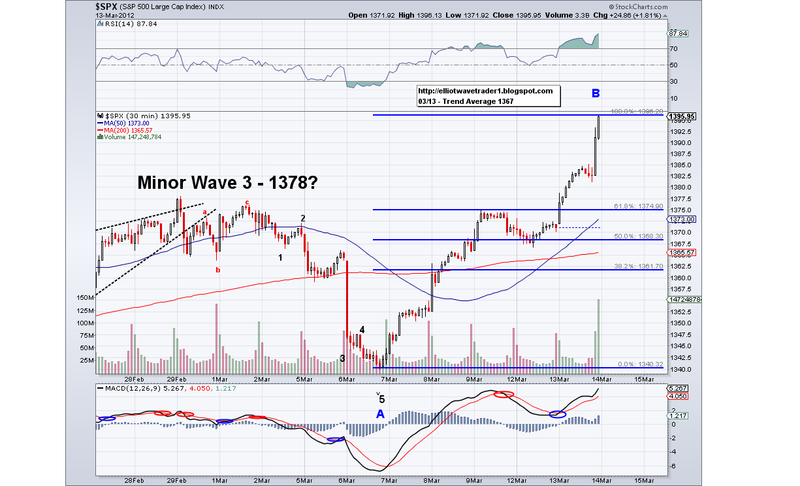 1387 Low to be challenged? 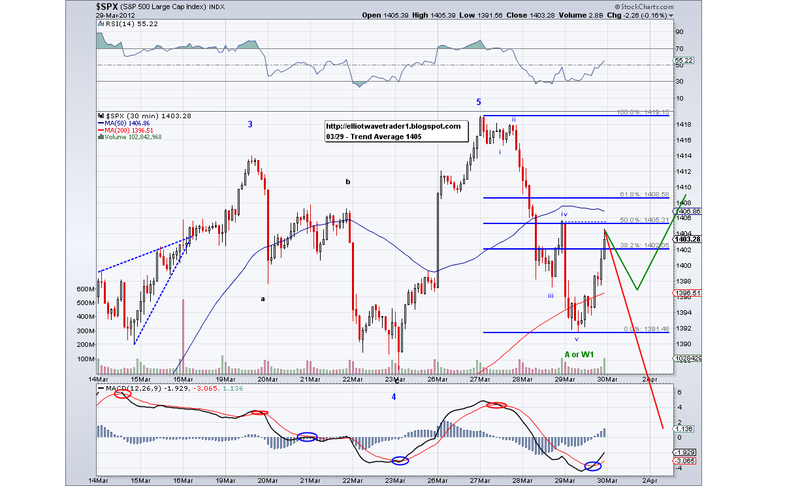 The 1420 level definitely got a reaction out of the market and it's now up to the optimists to make their case. I see a bearish impulse completed at 1397, however these 5 waves could have been just the W3 so the bounce is either a W4 with more downside to come tomorrow or a B/W2 to the 1407-1414 level. 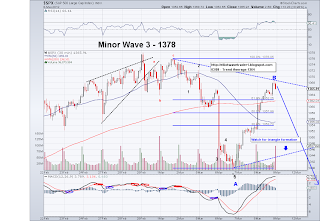 Whatever the case, odds favor the 1387 low being challenged on the C/W3 wave and if that is taken out it will confirm a complete 5th wave that ended at 1419 and eliminates the hope that it is a W1 of a V. So let's see how the so called window dressing holds up the market for the rest of the week. 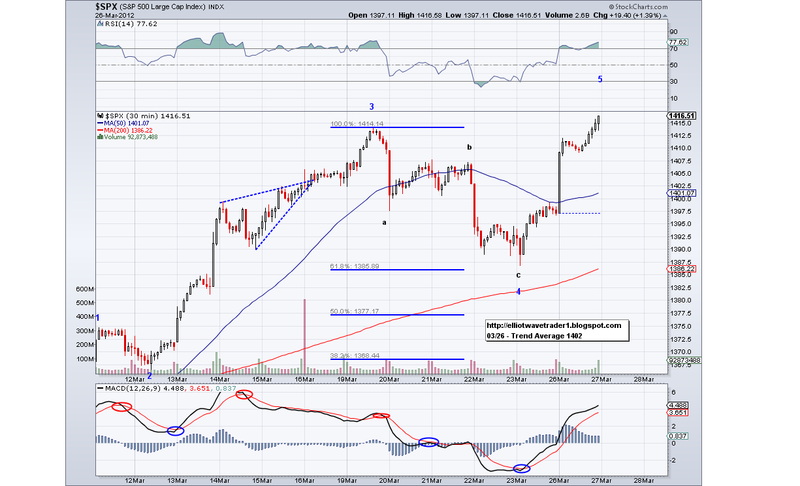 I first mentioned the 1420 level as a target over a week ago and today we got pretty close at 1419. 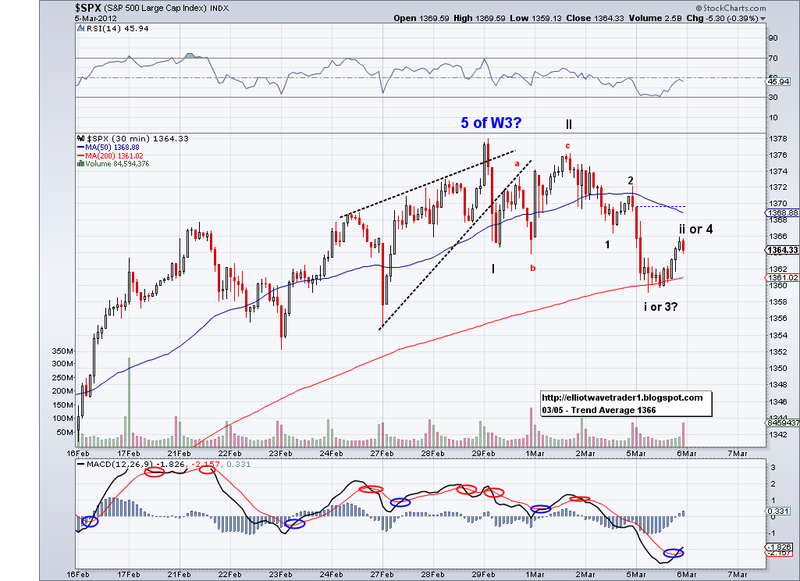 So now that we got this higher high and what seems to me like 5 waves completed, it is time for a correction. 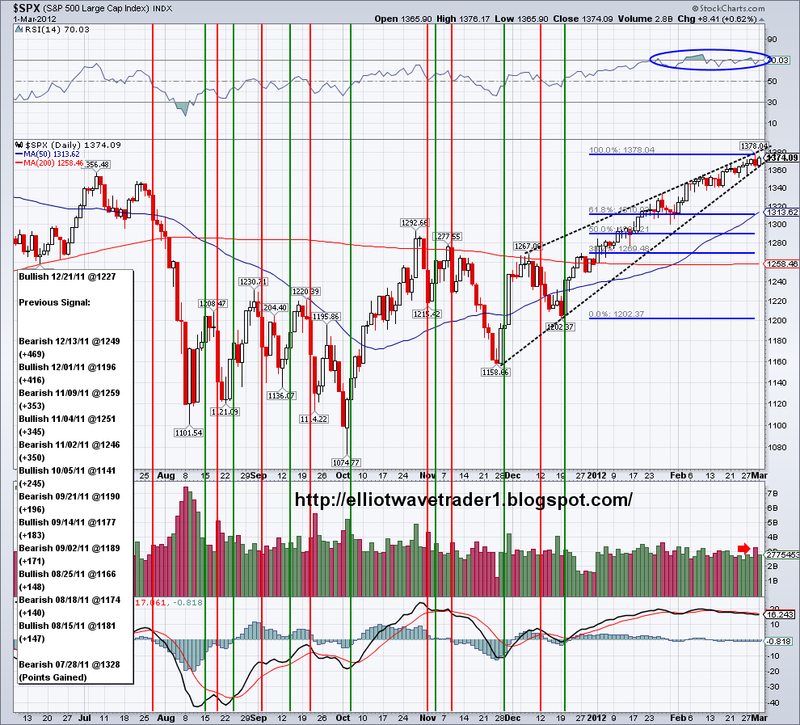 Now how the market behaves in this correction is crucial to what's coming in April. If the market does zigs zags without much impulsive action to the downside then this open the possibility of this being a Wave 1 of V, which would imply a small correction and then a lot more upside to come. But as it is, the waves look to me like the need to be retraced way back to low 1300's so the market can gain more traction to go up to the 1510 target. So it will be an interesting few days.. And again all indicators (sentiment, oscillators, etc) have not been reliable over the past two months and what normally would occur in a ridiculously overbought market has not happened, so how the market behaves around the Trend Average should dictate what's to come. I loaded up on some SDS today and will log the trades later tonight.. got to run go get wifey. The market has done exactly as I had been expecting since last week. In fact, I didn't even add any new labels as the market just went to where I labeled the projected wave numbers. 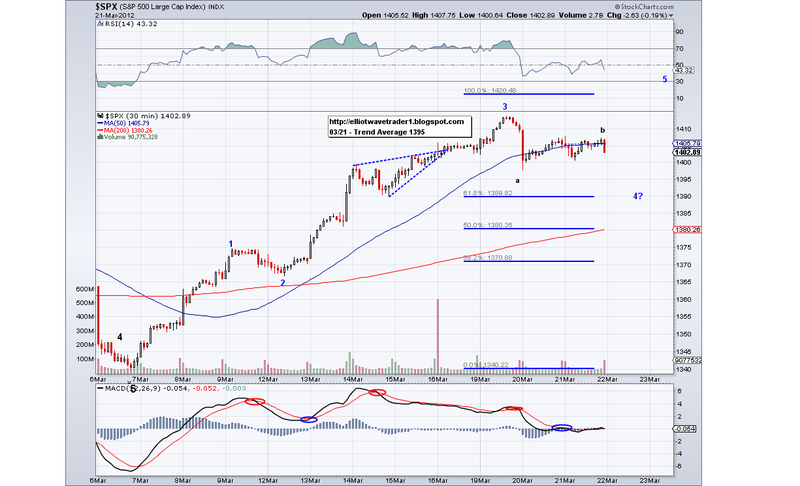 Today's rally was a strong one and it was able to break 1414 without much hesitation. However, the next big test is the number I've mentioned last week which is 1420 (2X W1 of this W3). 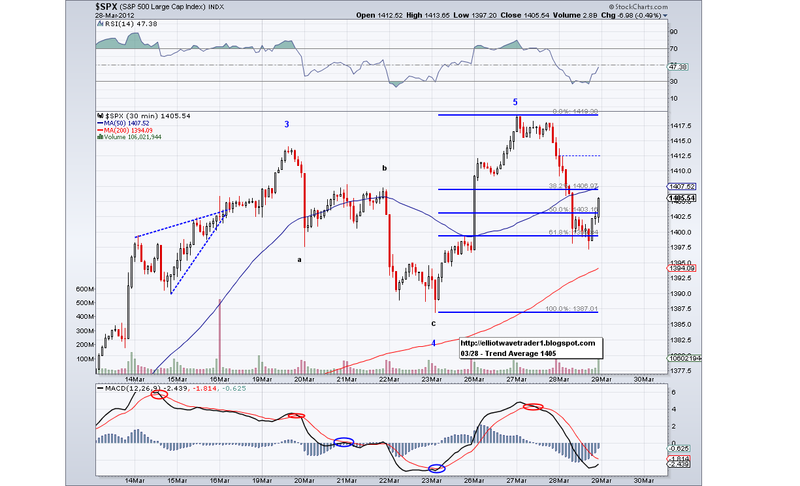 We got a sell off last time we reached a Fib number (1378) so we'll see if this one does the trick. 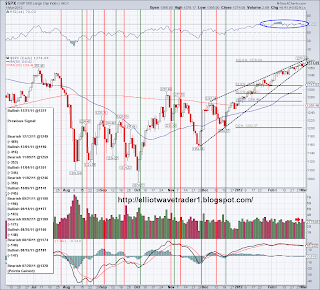 If this doesn't stop the market, there is a good chance the market will see a very bullish April and reach 1500. All oscillators are useless at this point so watch that Trend Average (1402) which is telling us to stay long or at least hedged. I sold my SSO today and loaded up on IXV and then sold(the inverse of VXX) to fully hedge my VIX positions. I'm not bad a trading but I do get a bit greedy at times with my portfolio management. So if there is one thing I should learn from this wave is never put more than 30% of my trading portfolio on a single stock/etf. I will post my trades later tonight. The market made a lower low today and it closed under the Trend Average for the second day in a row, which usually confirms a trend change. 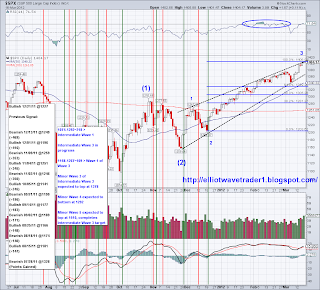 However, because the trend is still rising, the market's trend change is not confirmed until it starts going down. so next week will be key for this wave, we go up in one last impulsive wave to challenge 1414 or we gap down/sell off Monday as I see a nested 1-2 set up. I favor some more upside given the fact that it is the end of the quarter and portfolio managers will be window dressing and the sell off to start early April. So we'll see..
Hope we get that sell off soon, my VIX positions need it!! Have a great weekend. 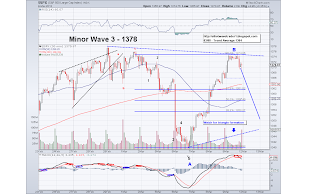 The market put in a C leg today to the 1390 area and now I am expecting the start of the 5th wave to a higher high unless this turns into a complex W4 correction. However, if the market stays below the trend average then there is a good chance for a change of trend that will finally bring the correction many of us have been waiting for. But for now, I'll assume we'll get another stab at 1414 so I can sell my longs and load up on some shorts :) and btw I hope no one has been holding TVIX, talk about a sell off/scam! 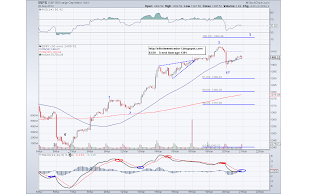 The market started to triangulate today and one could interpret this as a B wave with a C wave still to come to test 1390 or W4 triangle that is getting ready to break out to the upside and challenge the 1414 high. 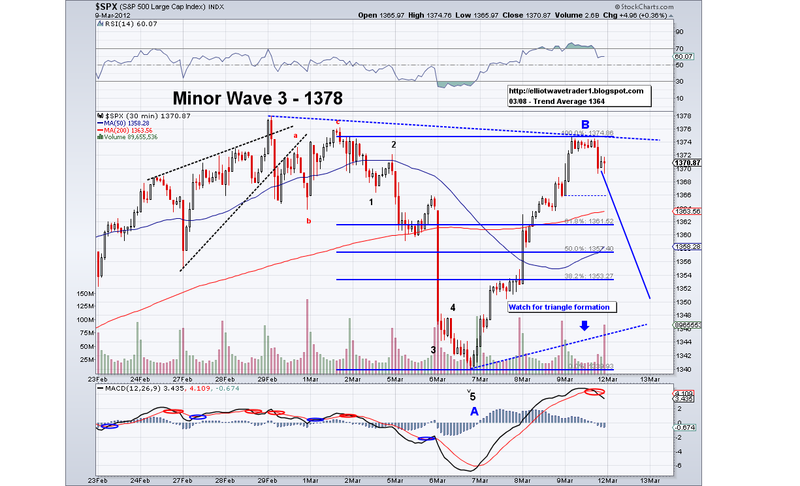 Whatever the case, it appears there is a 5th wave left in the formation so I am assuming we'll see 1420. The trend average is at 1395 and rising and it's quite possible to get another 30 point gap from the TA before the market finally (and I do hope finally!) starts a substantial correction. 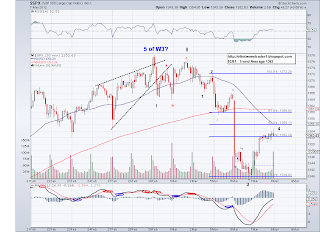 The market corrected today as expected, however since the "W4" to 1340 had 5 impulsive waves down and no zig zag, we could probably assume the same for this W4 with 1397 being the low. 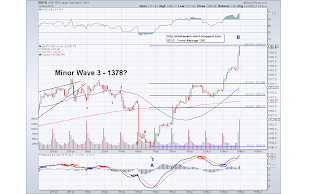 But if this wave were to behave they way it is supposed to, then we should see a C wave down to test the Trend Average or the 1390 level tomorrow. There was no way to tell whether the rebounding wave today as a B wave or a W1 of W5 that would target 1420, so we'll just have to see tomorrow morning. I ended selling my SDS position and I will log the trade tomorrow as it's been a hectic last couple of days for me. 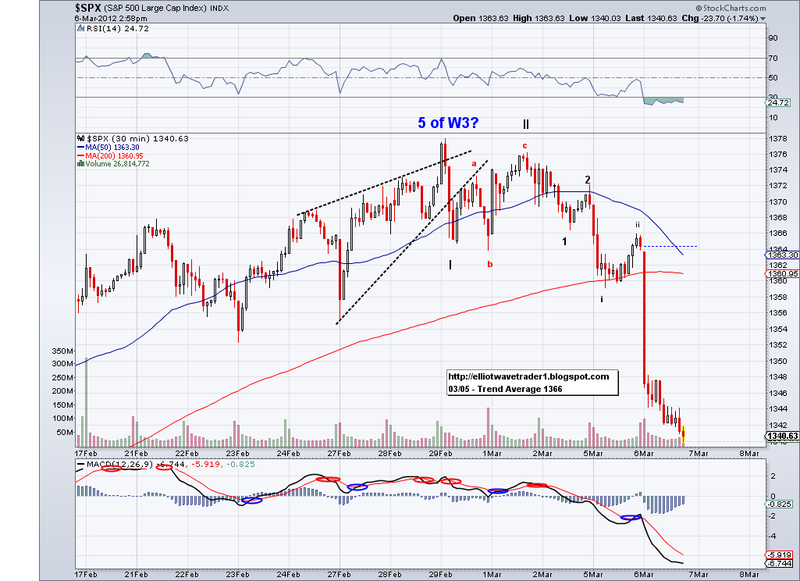 And I hope the market starts that intermediate W4 correction soon! 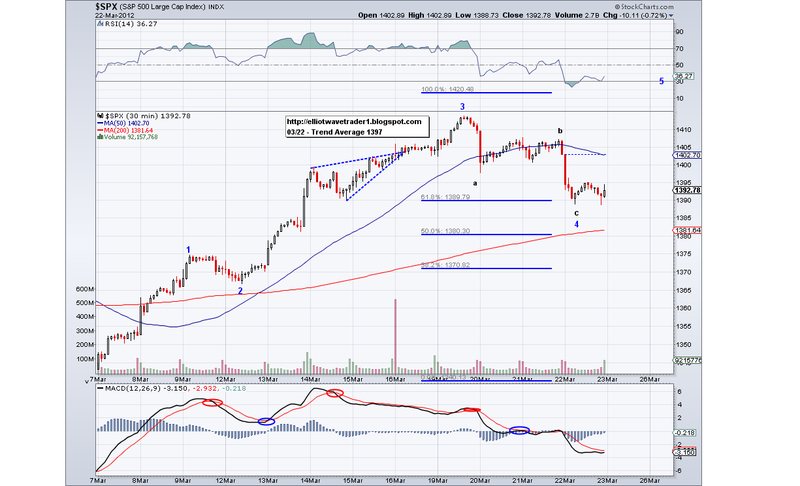 I was correct today in the market getting to 1409 but wrong on the day ending bearish. Not that it was overly bullish considering the market faded in the last hour but I am just not seeing the type of correction that would start something that would get the market down more than couple of dozen points. And since this looks to me like it is still a W3 in the works, let's just assume the market will make it to 2 X W1 so 1420. 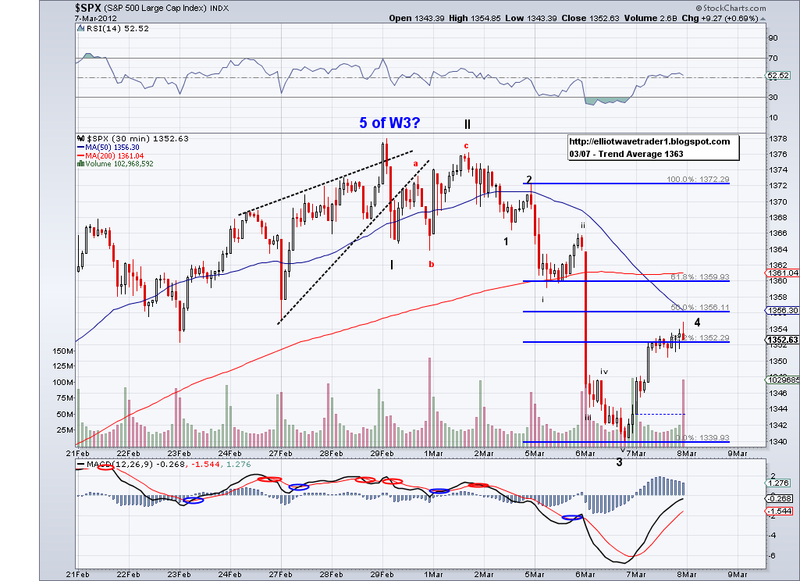 Assuming the market ended W3 today, we should see a smaller correction to the Trend Average or close by before putting in another wave to 1420, looks about right. So the wait continues.. I bought some SDS today that I will probably cash in when the market correct and then possible go long to hedge my current vix positions. I will post trades tomorrow as I am running late right now.. 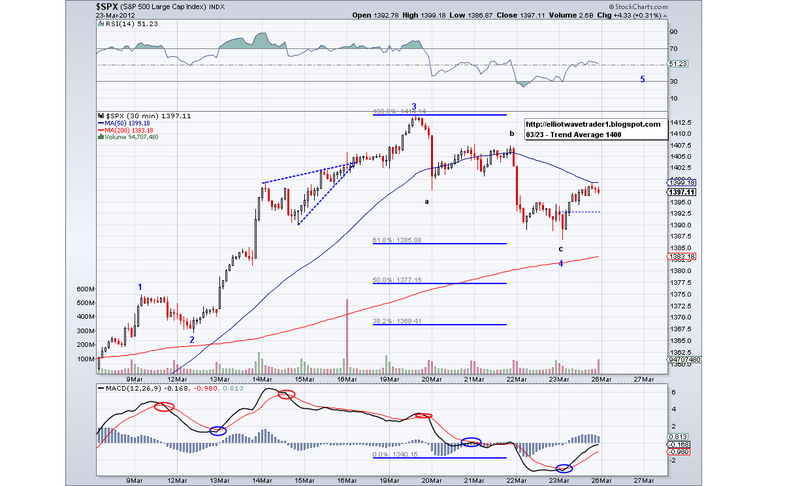 The market still had a little left and continued to push a bit higher today. 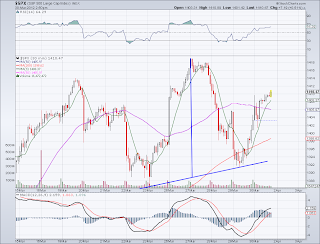 There is a potential Ascending Triangle (typical of W4's) targeting 1409 so we'll see if that plays out in pre-market or the cash market. Whatever the case, we should see a down Monday and it'll be interesting to see if the next wave is going to be another correction or an actual sell off. 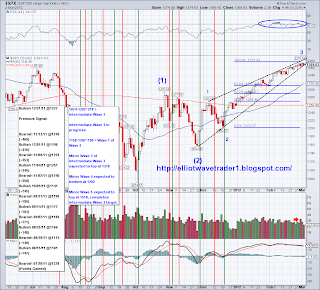 The market looks like a wedge so it holds the potential for a swift bearish wave. 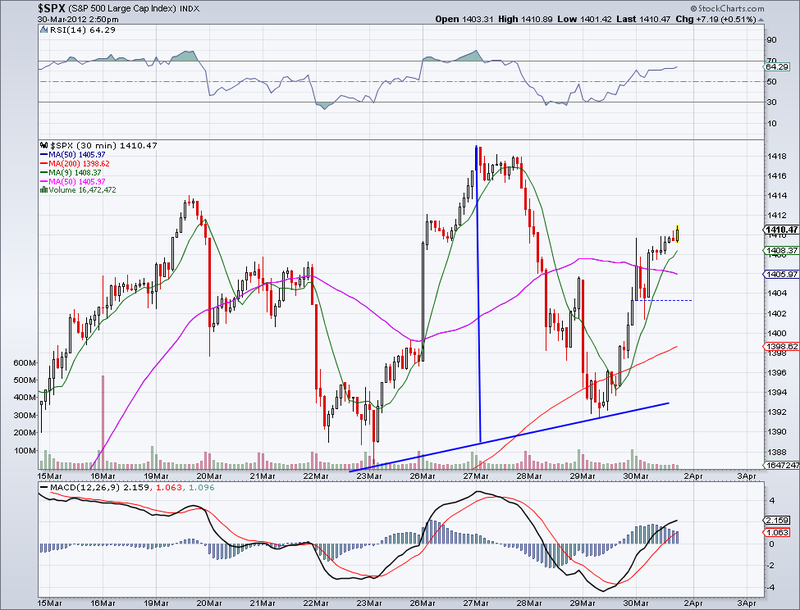 I think if the market holds above the Trend Average then it will have more room to go. So far the best indicator out of all (Oscillators, Wave counting, Money flow, etc) has been the TA so that is what we should be watching. If we get a minor gap up Monday I will be shorting the market. I started a short trade in the morning but closed it at break even after seeing the triangle, so no need to log this trade as it did nothing to my positions. The market reached 1400 in what I see as a 5th wave and now this should be the end on this particular leg, which I am still not sure how to label. 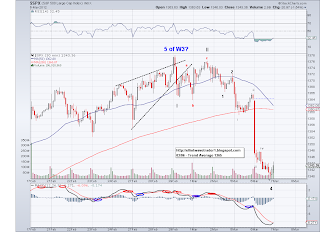 And like I posted yesterday, this could be just the end of a W3 as it is exactly the same length as W1 but as it is I see a 5 wave count complete. I could also stretch my imagination and see a zig zag (5-3-5) so tomorrow should give us a better picture of what is to come. If we see more sideways trading then we'll see more bullish waves on top of this one. Looking at what the market did today it seems like there is more upside to come. 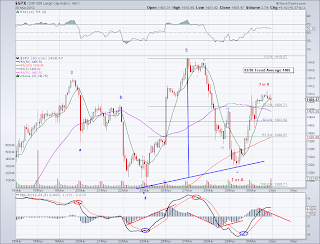 I see a regular zig zag for a W4, which implies another impulsive wave as soon as tomorrow to go over 1400. 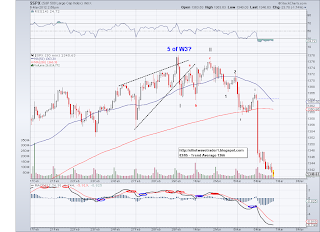 However, W1 is 35 points on the chart so that W4 might be just the for the W3 and if that is the case the target would be 1402 if we assume W3=W1 so there could be a lot more upside if that turns out to be the case. 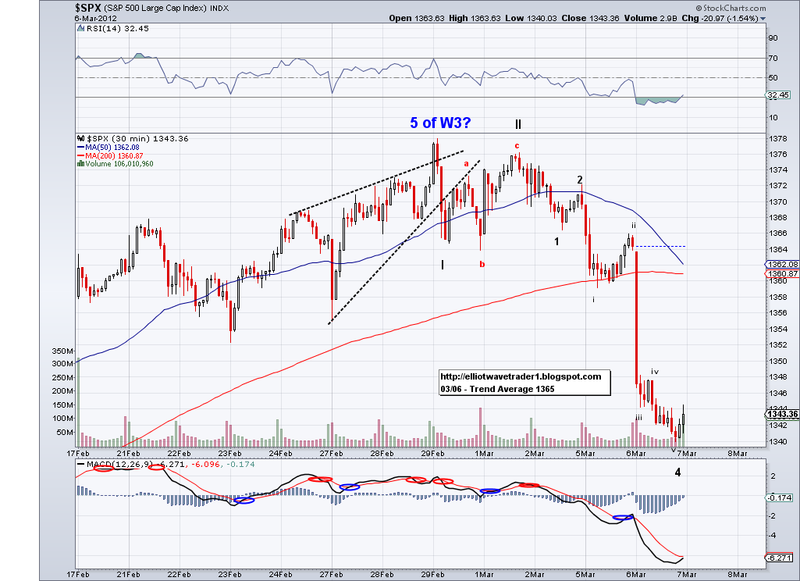 The chart I posted just assumes that W1 will be the longest wave and the most conservative bullish option. There is a roll over on the MACD and the market is as extended as it can be but the pattern and the Trend Avg favors further upside. The market spent 9 sessions trying to overcome 1378 and today it broke it but almost 20 points, so it was a horrific days for anyone playing the bearish side. Volume today was also strong which points to a high probability of 1400+. So while the market is ridiculously overbought and due for a pullback (since last month), it's hard to fight this trend and the mania behind. It's hard for me to think who in the world would be buying stocks at this level but I guess there are enough of them to power this thing up. So I am still labeling this wave as a pontential B of an expanded flat, although chances are looking dim. 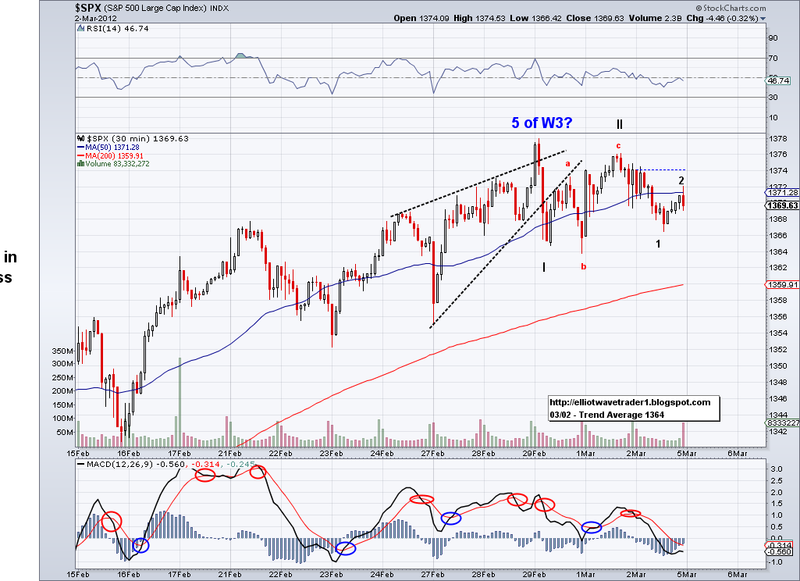 For this structure to have a chance, we would have to turn down starting tomorrow and see a substantial sell off. 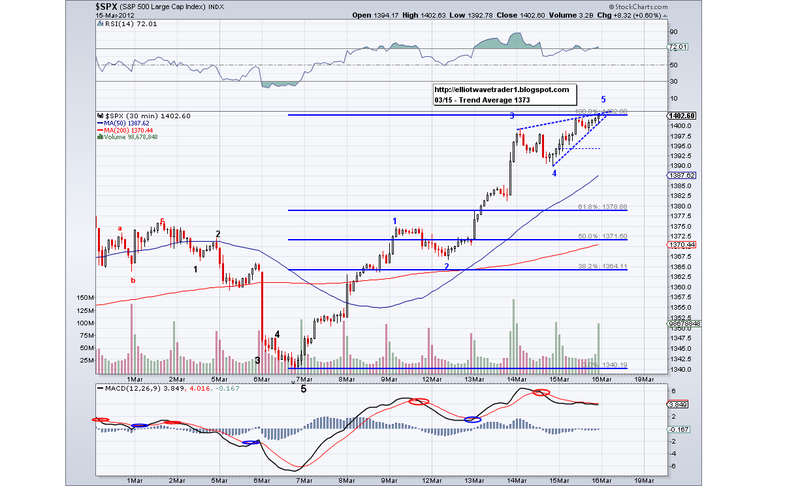 More consolidation and it will mean we're going for 1407. The wave that ended the session today felt like a W3 so there might be just one more minute wave to it. I went margin long on the VIX earlier today but it just didn't feel right to hold these things overnight on margin, so I sold at a loss today. However, I am keeping my original portions of VIX and I now have gone from VIX trader to VIX investor as this position is trapped. 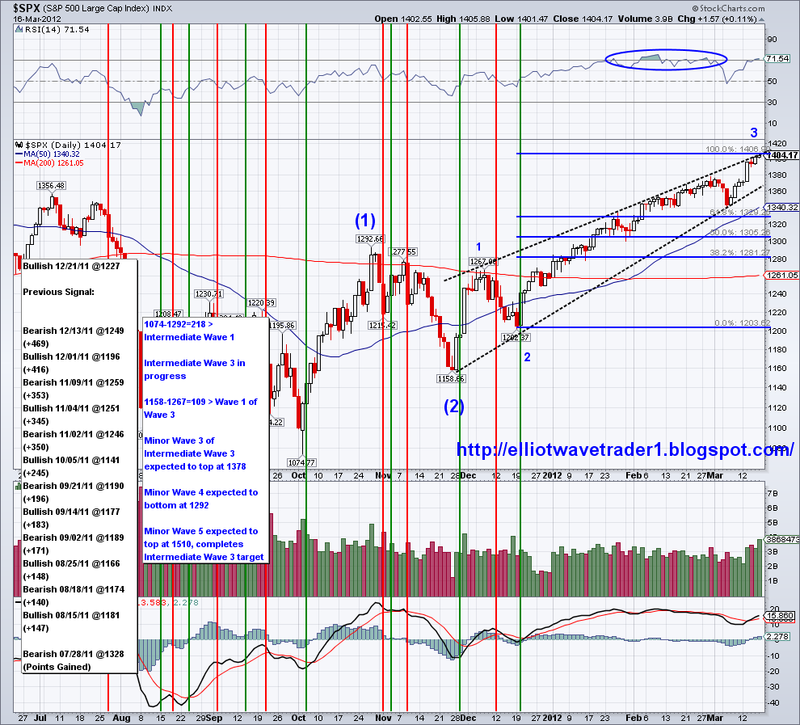 However, all the optimism will end as it always does and then the bullish/bearish sentiment cycle will reset. I remember the start of this rally and the news on those days or like BAC, which made its low the day it was downgraded by "experts" and that now has rallied 60% since then.. be greedy when others are fearful, fearful when others are greedy, works like clockwork. 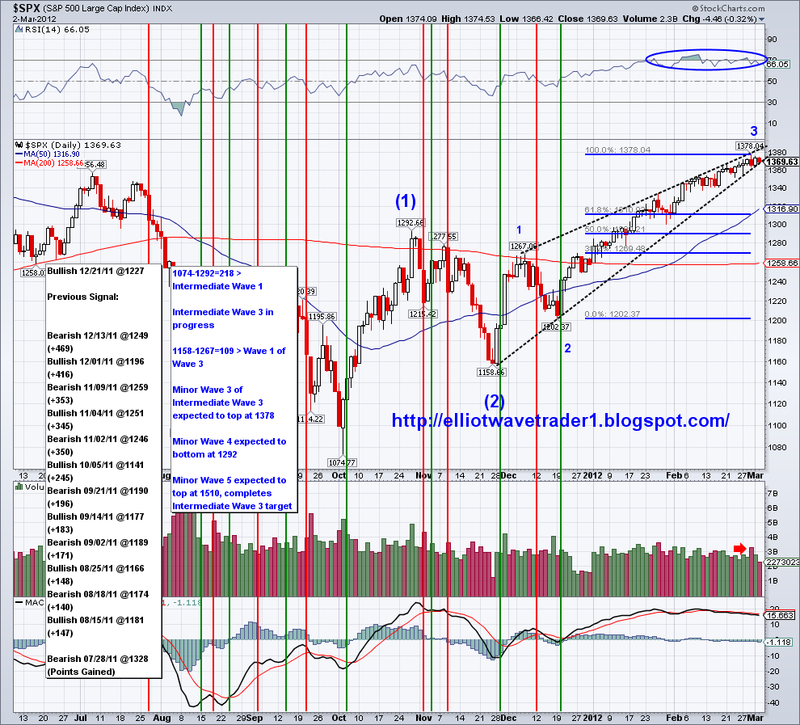 The market seems like it started a zig zag correction but it is still too early to tell. Going by waves one could argue for the start of a 5 wave up for the final 5th on the B wave, so it is impossible to tell. It's been now 9 days since the market reached the 1378 top and bulls are trying hard to make it past that level, however I doubt we'll see another 9 sessions doing the same thing. So I am just patiently waiting.. and waiting. I sold my SDS positions today to lock in some profit and have margin available should the VIX continue to make an extreme low (it is already trading outside its Bollinger Band but could still go lower should the market have another 5th wave in it). My one mistake with this trade was not raising my stop loss to break even after I first took profit, I got greedy so next time I'll stick to the trading rules. 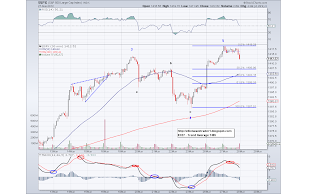 The market surprised to the upside (surprised me that is) and I am trashing my complicated triple nested bearish count, which was looking pretty solid up to yesterday. 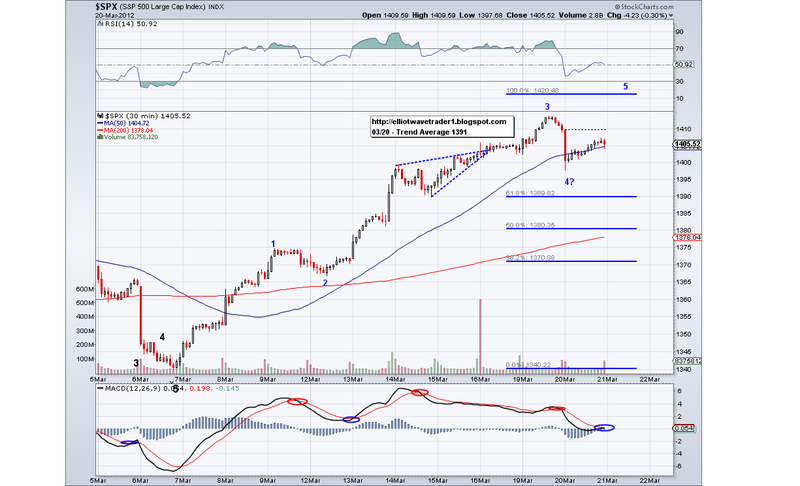 So instead I am labeling the impulsive move from 1372 to 1340 an A and the rally from the last couple of days as a B, which implies a C wave should be coming as soon as tomorrow. 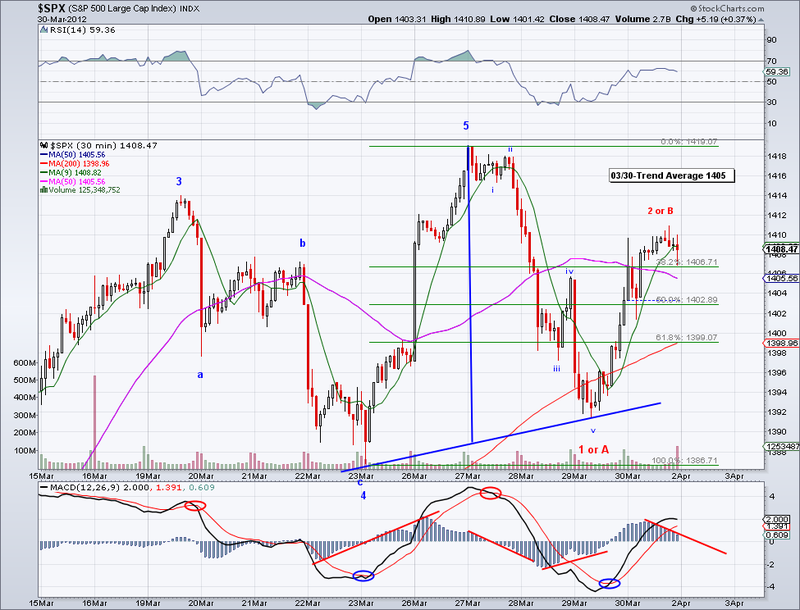 And how this C wave behaves will probably set the tone for next week. If we get an impulsive bearish wave down and make a new low then we might see a correction that will go to the 1297 level I mentioned a few days ago. 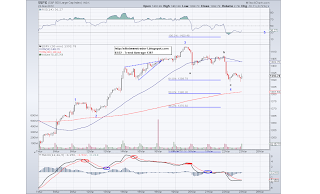 But if the market zig zags its way to its retracement area and finds support, the market will be setting itself up for another impulsive wave up to challenge 1378. Another possibility to watch is a triangle correction for the W4 Minor, which would imply more of a sideways/time correction before gunning for 1400+. And as bullish as the day was today, this could well be a sucker's rally. 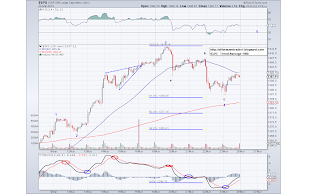 The market is already overbought and it is likely to make a lower high, so the downtrend is well in place despite the market closing narrowly above the TA. Also worth noting is the money outflows of stocks that have been leading the market in the last couple of days, that means selling into strength. It's all about wave C at this point.. No movement in my positions today but if I find market hesitation at the Fib level, I will close half positions (hopefully at a profit) and ride the rest until the TA gives me a sell signal. 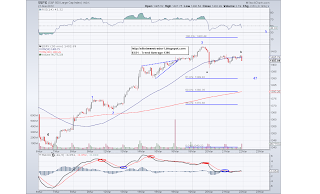 The market bounced today as expected and the W3 (1372-1340) from yesterday retraced into its Fib territory, which prepares the market for another leg down as soon as tomorrow. And since this is a triple nested count (the first one I've seen in a long time), the market needs another leg down to finish a III. 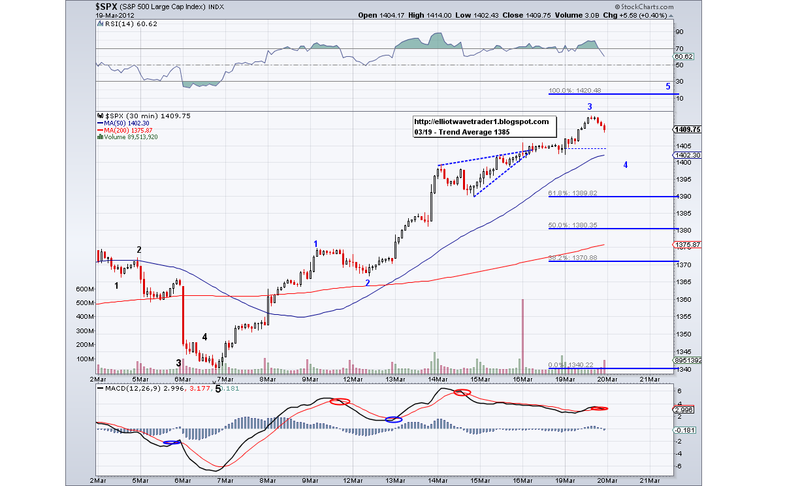 Only to start a IV bounce to its Fib territory but this time counting from II which is 1376. It is worth nothing W1 (1376-1366) was around 10 points and the W3 that was put in yesterday was about 32 points, which implies 10 x 1.618 x 2 = 32. So W5 might end up being 16 points or 32 points, which would take us down to 1322-1338 if the W4 high was put in today at 1354. All speculation obviously so we'll see how it plays out. The Trend Average has started to drop and it is at 1363. 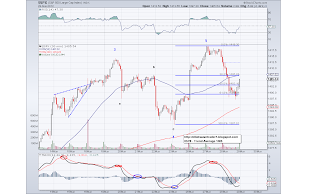 The market gapped down following the triple nested bearish 1-2 count posted yesterday and so far it looks like 5 waves within a 3rd are finished, so there is more downside ahead. 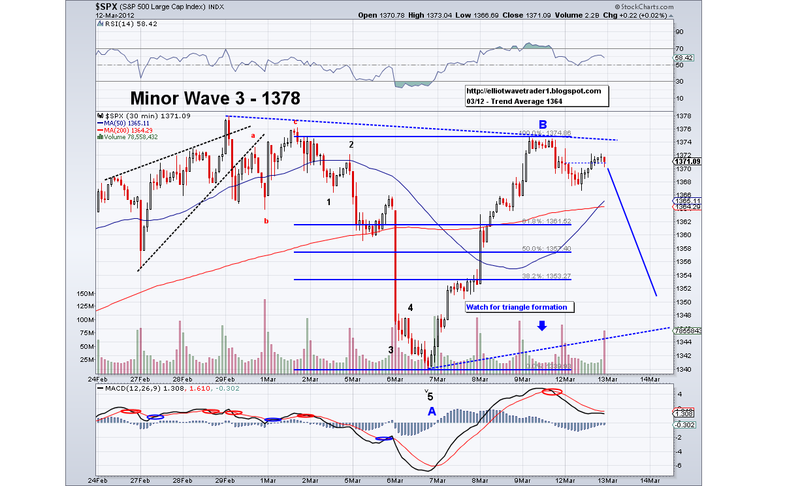 I first posted about the 1376-1378 level couple of months ago and this turned out to be the top of this wave. So following the long term count, I see the potential for a bottom at 1297, if not the 200 day MA depending on how deep the B wave retraces. Right now we're just getting started on A and that could go as deep as 1320's more or less (or about 40 points below the Trend Average), at which time one could possibly entertain some longs to play the bounce. The market finally closed under its trend average and now we need confirmation by having another close tomorrow under the TA, preferably in a get away gap down. 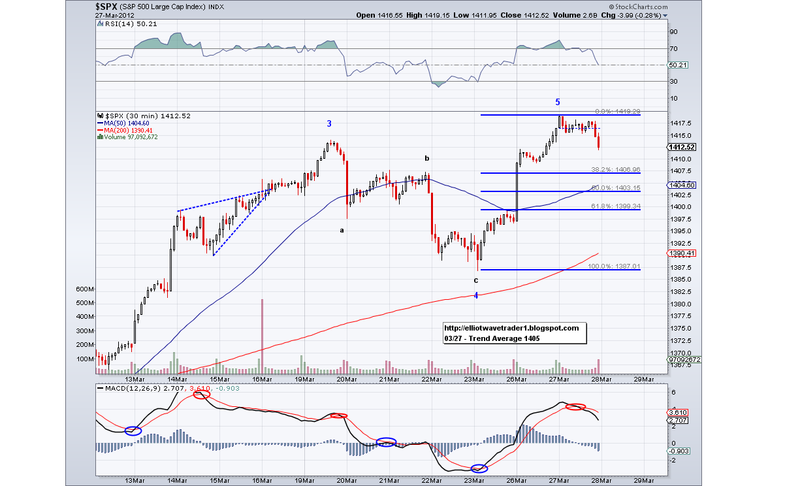 If the market can push thru 1366 and close above it again then it it will still have a chance at another stab at 1378. But so far, it seems like the market is rolling over and the burden is on the bulls to gain ground lost today. I am keeping my positions and I think it was interesting the VIX went up 4%+ but my VIX ETN actually ended negative. I think last time I saw that was few weeks ago when I started trading it and the next few days it jumped 5 points. It's a weird and volatile instrument and I guess that's what makes it challenging to trade but in a good way. 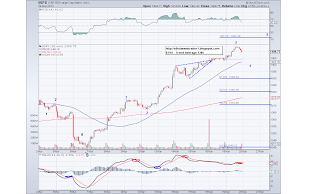 It is always risky to pre-empt a change of trend but since we've reached an important Fib ratio (1376-1378), I am going to start assuming the correction will start any time now. And the chart I posted today reflects that, I see a bearish nested 1-2 set up that should gap down Monday or start bullish and sell off hard. 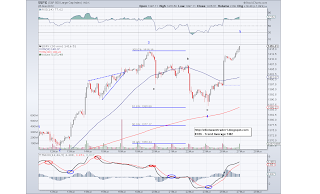 There is the possibility of a higher high given the fact the market managed to testthe Trend Average a 3rd time in the last few sessions today at 1366 and using the TA system alone would have us staying long. 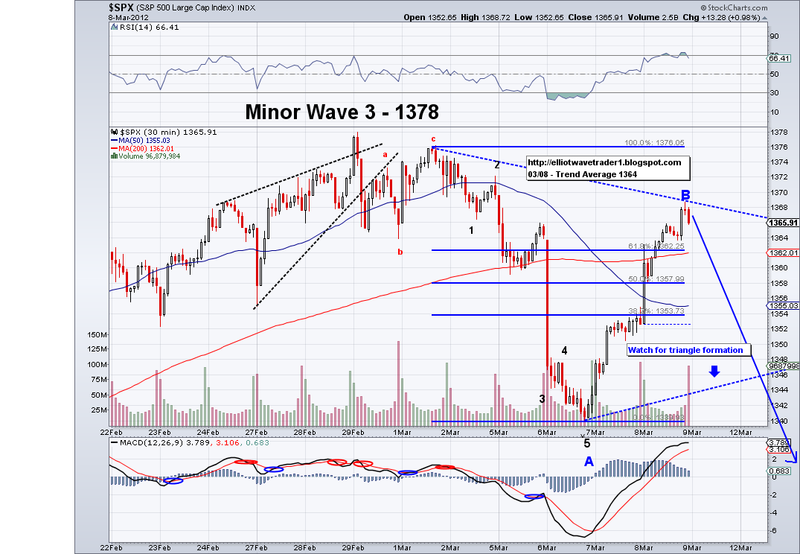 The market needs to break 1366 on Monday, if that holds then we could go up to 1380's. But considering all the other signals, I am comfortable in going against the trend at this point. I am keeping my volatility positions and hoping they will shoot up 10 points next week! lol. Today I decided to post the longer term chart that I follow. The market continues to grind higher and this is the longest run I've seen since I started tracking trend changes. Notice how this market technically became overbought when the daily RSI hit 70 back in mid January(this is the reason why one can not count on oscillators alone) and it has been stuck there ever since. 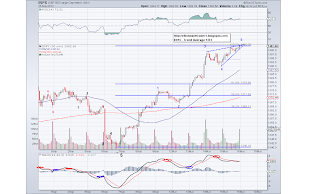 And while the market can get stuck in this mode some more, the price advance is occurring in this rising wedge that has a high probability of collapsing in an abrupt manner, similar to the way gold collapsed yesterday where an entire month's worth of gains were wiped out in one trading session. 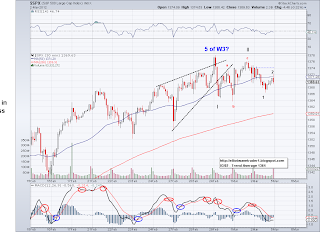 So while I now favor higher highs for the year for the market, I think the market shows we are at the end of a W3 and it should be a matter of days and not weeks before seeing some healthy selling. I am keeping my positions intact and waiting patiently on being right on the top.